Why Choose TURBOSII JEEP WRANGLER LED HEADLIGHTS? 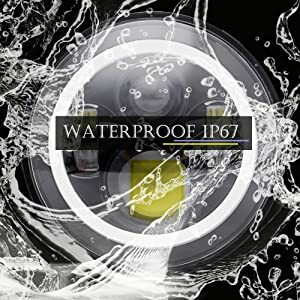 Dedicated to communicate with our customers, we provide the superior-quality products and best service for each customer. Valid irradiation distance longer than normal bulb. Long life span above 50000 hours. Newest Fantastic Design LED Headlight replaces original halogen and HID headligh. Heavy Duty Aluminum: Solid cast aluminum is designed to withstand any harsh environment while doubling as heat sink. White halo ring for daytime running light. Amber beam for turn signal lights. Color Temperature: Cool White 6000K. 7 inch 60W Headlight with Halo Angel Eyes DRL & Amber Turn Signal Light & High/Low Beam (4800 LM & 3600LM). Equipped with High Quality Cree Chip，Brightness is 3 times more than traditional halogen lamps，which is the best replacement item. The white wire for DRL. 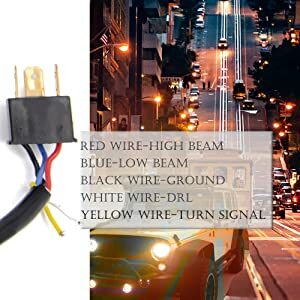 The yellow wire for turn signal. Plug and Play,usually install in 20 minutes. It’s usual the headlight might have mist of the first time to use. For sure, the water molecule in the air inside the lamp will be discharged from the headlight and keeps clean forever as the temperature rises during use of the light. 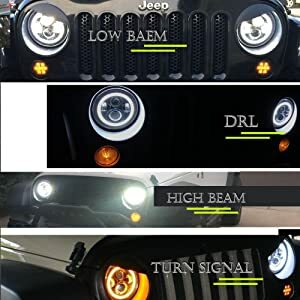 2pcs 7 inch JEEP Wrangler LED headlight. 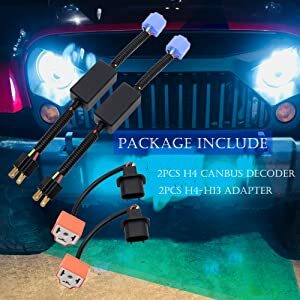 2pcs H4 to H13 adapters. 2pcs H4 antiflicker error free adapter. 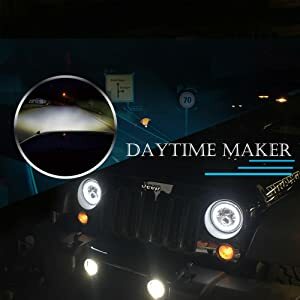 Headlight come with built-in EMC function and anti-flicker hardness for prevent flickering or interfering your jeep radio,no need to buy extra decoder or hardness! And so Easy to install, installation included.